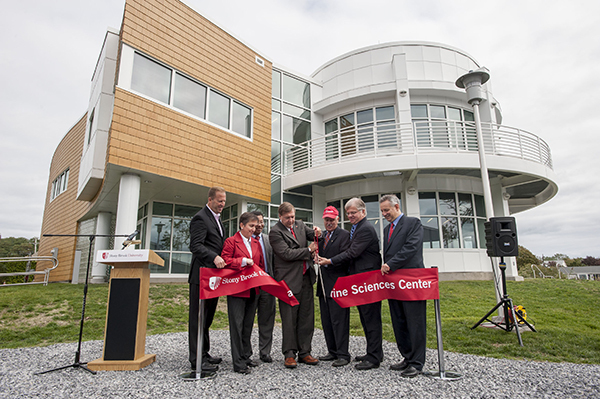 Pictured is the ribbon-cutting ceremony for SBU’s new 15,000-square-foot, $6.9 million state-of-the-art LEED-certified Marine Sciences Center for the School of Marine and Atmospheric Sciences (SoMAS). (March) – A multitude of friends and former students gave to the University in historic fashion – helping to raise a staggering $200 million in 12 months. The collective gift– involving more than 1,500 donors–was the largest in the University’s 57-year history, and is the sixth largest donation ever made to an American public university, according to The Chronicle of Higher Education. The catalyst was a $50 million matching challenge as part of the $150 million gift from philanthropist James Simons and his wife Stony Brook alumna Marilyn Hawrys Simons ’74, ’84. The gift creates a number of scholarships, fellowships and endowed chairs while supporting wide range of programs, from medicine and marine sciences to advanced computing, Hellenic studies and modern art. 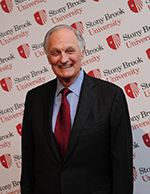 Stony Brook University’s Center for Communicating Science was renamed in honor of Alan Alda, the renowned actor, director, writer and Visiting professor in the School of Journalism. (April) – A Stony Brook University’s Center for Communicating Science, the first of its kind in the United States, was renamed in honor of Alan Alda, the renowned actor, director, writer and Visiting Professor in the Stony Brook University School of Journalism. 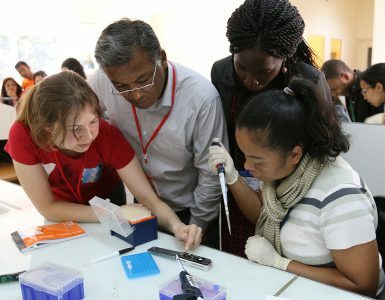 The Center’s goal is to enhance public understanding of science by helping scientists and health professionals learn to communicate more effectively with the public, including public officials, students, the media, and colleagues in other disciplines.The announcement was made at the ‘Stars of Stony Brook Gala’ at which Alda was an honoree. University Growth: New Facilities and Construction Projects enhance programs and services – Groundbreaking for and completion of campus facilities projects marked Stony Brook’s growth and trajectory in 2013. Stony Brook broke ground on a $423 million expansion project, the Medical and Research Translation (MART) Building, that will advance research and clinical care at Stony Brook Medicine; opened the doors to a spectacular new 15,000-square-foot, $6.9 million state-of-the-art LEED-certified Marine Sciences Center for the School of Marine and Atmospheric Sciences (SoMAS); and cut the ribbon of Frey Hall, a $31M, 95,000 square-foot renovation project that began in March 2011. The building is the first dedicated solely to classroom space on the Long Island campus. Campus dining added new food and a new facility as West Side Dining, a brand new 8,000-square-foot building, opened this fall. The state-of-the-art dining space offers innovative food selections for students. 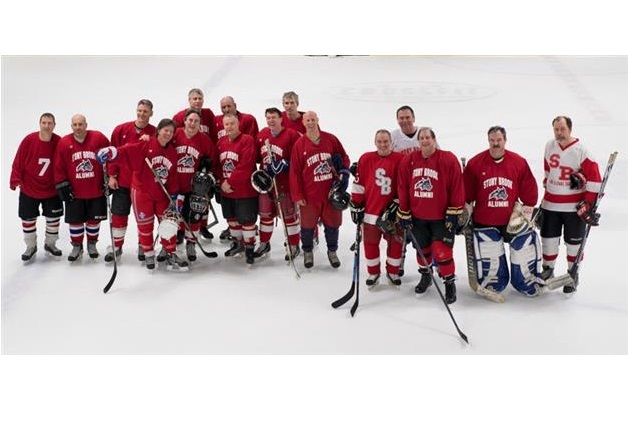 Starting in the Fall of 2014 fans can cheer Long Island’s top college teams in Long Island’s premier sports venue — the new 4,000-seat Stony Brook Arena. Home to Stony Brook men’s and women’s basketball teams, the new arena will deliver the ultimate fan experience, including championship Seawolves basketball action, concerts and the best in family-friendly entertainment. 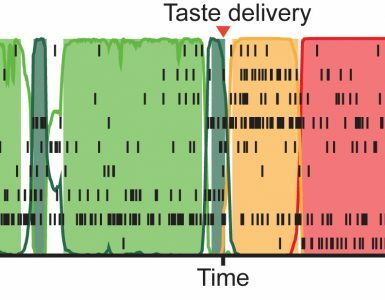 , an international team of researchers, led by Stony Brook’s Maureen O’Leary – also a research associate at the American Museum of Natural History – found a rat-size ancestor with a link man and beast. (August) –Pulitzer Prize winning journalist and author Carl Bernstein joined the faculty at Stony Brook University as Visiting Presidential Professor. Bernstein co-teaches and is a guest lecturer with an interdisciplinary focus in courses for the School of Journalism and departments of English, History, Political Science, Sociology and Writing and Rhetoric. In 2013 Pulitzer Prize winning journalist Carl Bernstein joined the SBU faculty as a Visiting Presidential Professor. (December) –As the aptly named Curiosity, a NASA Mars rover, scoured that planet’s surface as a potential habitat for life, either past or present, Stony Brook Department of Geosciences professors Scott McLennan and Joel Hurowitz made an exciting discovery–rocks preserved there represented an ancient geological environment that was habitable for microbial life. (October) –Stony Brook, where MRI technology was first developed, is among the first sites in the United States to offer simultaneous PET/MRI technology for clinical use. The new technology benefit patients by providing exceptional image quality and diagnostic capabilities, and greater efficiency by having two significant imaging procedures performed at the same time with low-dose radiation. (May) – A team of hand surgeons at Stony Brook University Hospital (SBUH) successfully reattached the hands of a 53-year-old sheet metal worker from Staten Island, NY, after an accident on May 16 nearly severed them. (December) – The IceCube Neutrino Observatory, a unique astrophysical telescope deployed deep in the Antarctic ice, is detecting neutrinos—very small, nearly massless particles—coming from the outer reaches of our galaxy and beyond. SBU Assistant Professor of Physics Joanna Kiryluk was part of the team that published the project’s ice-breaking results—the observation of 28 very high-energy particle events, the first solid evidence for astrophysical neutrinos from cosmic accelerators. (September) – Kevin Rosero, a 10-year-old boy from Ecuador, goes home after a team of Stony Brook surgical team led by Alexander Dagum and Henry Woo transformed his disfigured face due to a rare massive venous malformation. A big soccer fan, Kevin endured 10 surgeries and was given a VIP sendoff by his Stony Brook caregivers and the Stony Brook University NCAA Division I Men’s Soccer Team. 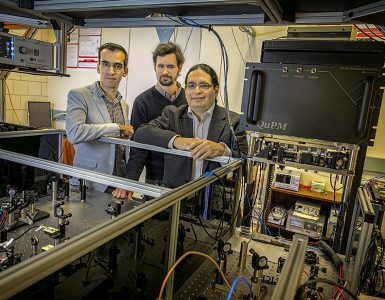 (May) – The results of a clinical trial published in The Lancet Infectious Diseases of an investigational Lyme disease vaccine co-developed by researchers at Stony Brook University, Brookhaven National Laboratory, and at healthcare company Baxter International S.A., revealed it to be promising and well tolerated. (December) – An international team of Astronomers led by SBU Prof. Jin Koda headed to Hawaii to use Suprime-Cam, Subaru Telescope’s wide-field, prime-focus camera, to capture an image of the intricate flow of Comet Lovejoy’s ion tail. The comet was discovered in September 2013 and the large telescope succeeded in capturing the unique image, which showed dust jets streaming from its Nucleus.